With 800 luxury residential units, 120 stand-alone landscape containers, 100 high-end retail stores and two acres of turf, The Domain poses several maintenance challenges. 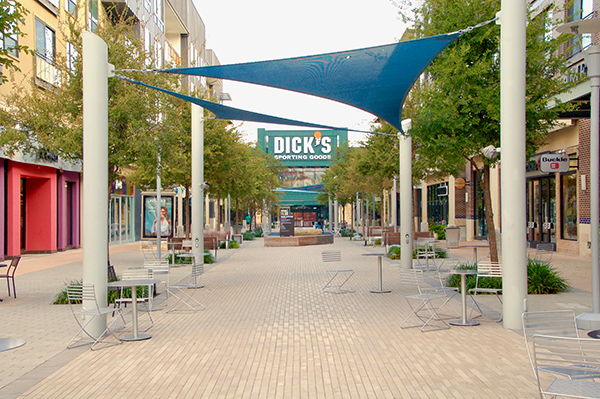 Based in Cedar Park, Texas, Native Land Design is up to the task and has been since it started maintaining the popular retail center and “hangout” space in June 2008. A three-man crew performs work on the site’s turf and beds before many venues open at 10 a.m. each weekday. The crew uses a 48-inch Walker mower, 60-inch Scag mower, a Hurricane blower and various pieces of two-cycle equipment at the site. The team rotates the plantings in the site’s containers six times a year. 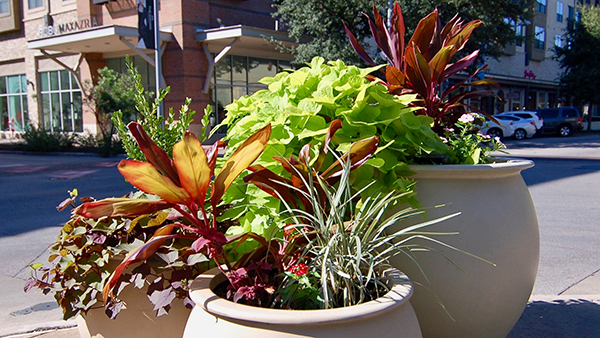 The containers feature a variety of perennials and shrubs and are irrigated using a water trailer and porter. Because the area is constantly under the public eye, the Native team also must be prepared to react to damage caused by ongoing construction projects and vehicular traffic. “When this happens, our irrigation and enhancements teams are mobilized to … ensure that any damages are addressed the same day,” says Robbie Huang, director of operations. 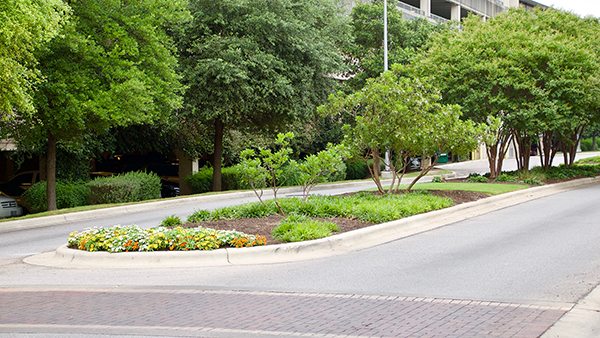 On the lookout for potential safety hazards, Native Land Design quickly repairs cracks in the pavement and ensures trees and shrubs don’t hang over walkways or block pathways. 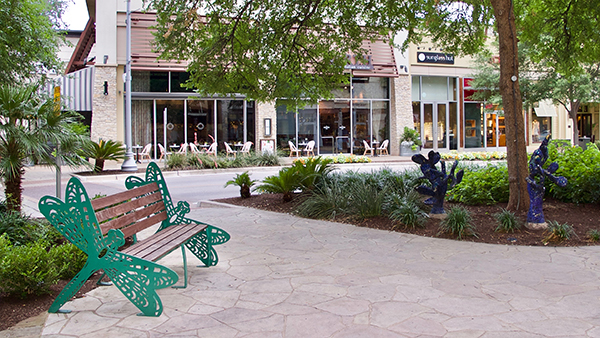 The work performed by Native Land Design helps keep the parklike atmosphere intact for shoppers, diners and residents alike. The large artificial lawn area, also known as “The Lawn,” where children can play. 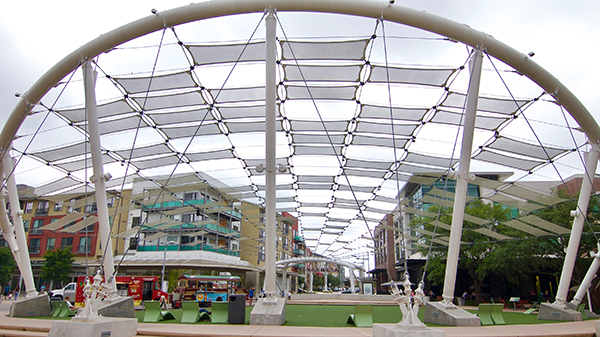 This area is also where live music acts perform weekly. 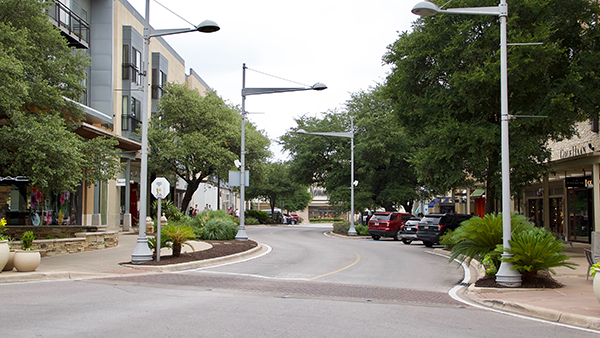 With residential units on the second and fourth floors, The Native Land Design team is unable to use motorized equipment prior to 7 a.m. due to the city’s noise ordinance. With retail stores opening at 10 a.m., the team has a tight window to get all of the maintenance done on all of the areas along storefronts. Domain Drive, the main road through the property. 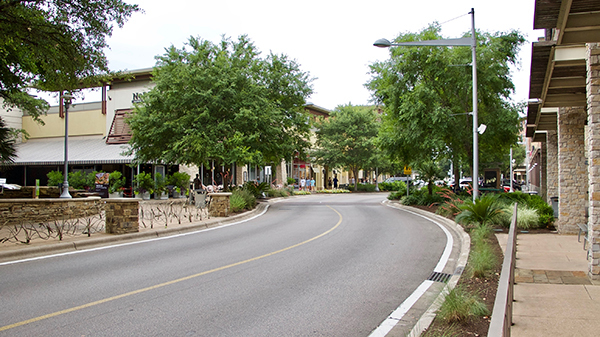 There is a lot of vehicular traffic as well as foot traffic through here, as this road separates the retail, residential and commercial areas. Nearby dumpsters for the residential units create lots of trash being blown into the landscape that the team’s porter is always on top of. 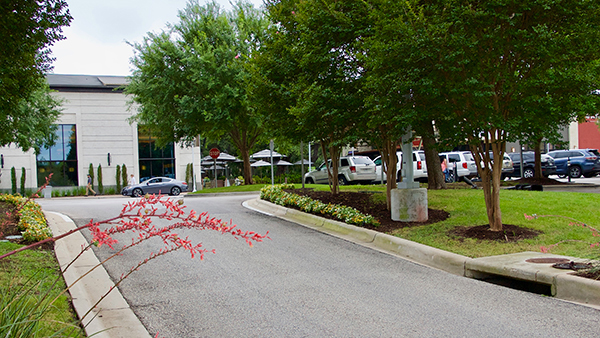 Exit drive from the valet area, where several upscale restaurants are located. The annual color and perennials provide not only an inviting welcome into the property, but also provide a warm departure for the guests. With limited parking close to restaurants, these are prime parking areas that are heavily trafficked. The stone retaining walls around native tree wells get damaged frequently and Native Land Design repairs them as needed. One of the many annual color beds throughout the property. With four color changes throughout the year, the crew keeps the displays looking their best with frequent fertilization, manual weed pulling and deadheading of spent blooms. 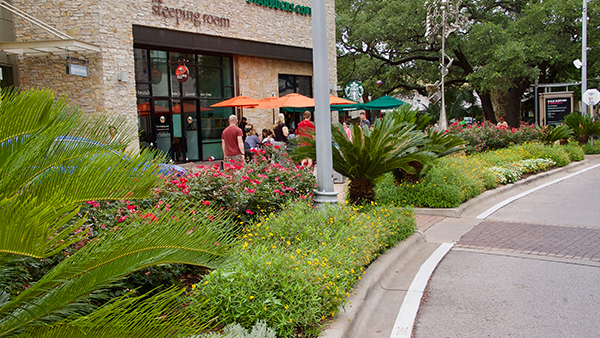 Maintaining these medians in a high-traffic area at the main entry into The Domain requires constant attention to the traffic, where shoppers, employees, residents and construction workers are traveling. The beds are frequently driven over, which requires the crew to remove and replace any damaged plant material, irrigation, soil and mulch. Focal bed at the center of the mall. With Starbucks, Apple and a park area here, this is the hub of The Domain, with lots of shoppers stopping to take a break and to enjoy the landscape. 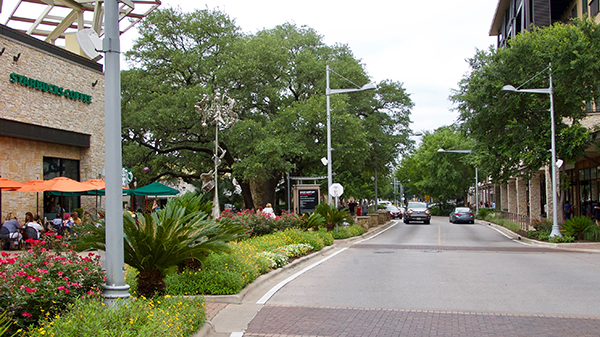 The crews and porter keep it looking its best by keeping the plant material separated, keeping the Sagos trimmed to allow pedestrians to see and be seen by vehicular traffic, removing weeds, hand-watering pots and blowing debris out of these areas. The crew at Native Land Design takes care to stay out of the way of those who frequent The Domain. 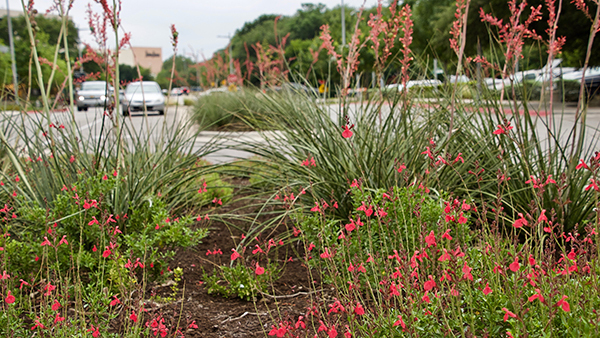 The Native Land Design team maintains the landscape beds that’re found outside of storefronts. Corridor through the mall, where there are lots of small beds that require tremendous attention due to all of the foot traffic every day. There are residential units on the second through fourth floors, so the crew members are unable to use motorized equipment prior to 7 a.m. due to the city’s noise ordinance. The retail stores open at 10 a.m., creating a small window of time for the team to perform maintenance. 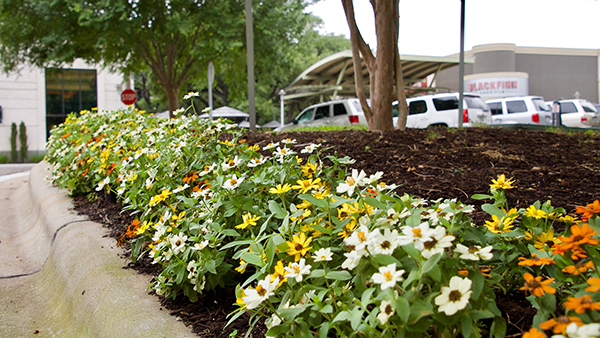 Crosswalk across the main corridor with some local artwork features in the landscape bed. 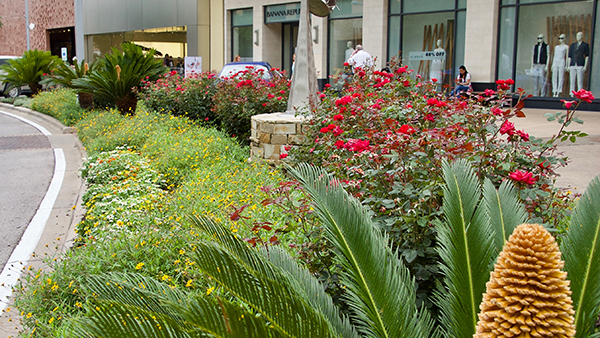 Beautiful, lush landscaping provides an inviting atmosphere and a pleasant experience for patrons as they shop. 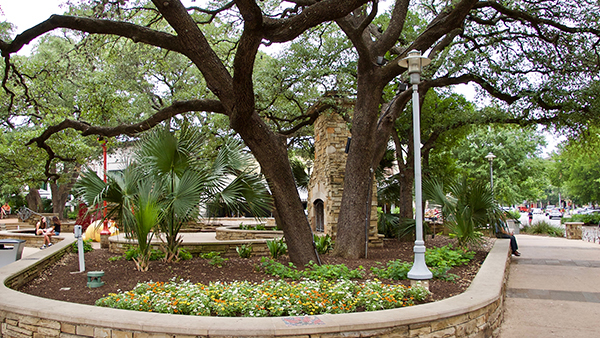 Large heritage oak trees provide shade at the Century Oaks Park at The Domain, where shoppers can relax and let the children play. Crews have to continuously pick up trash and debris here, as well as replace gravel and stones that excited little hands displace while playing numerous games here. 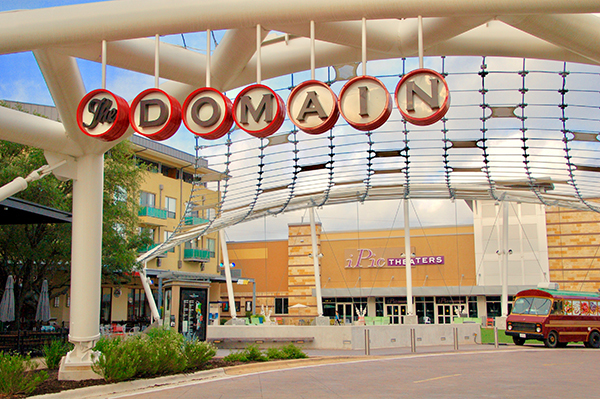 Large Domain sign and lush landscaping, welcoming patrons to the lawn area, where live music is performed and where children can play. The Domain offers a lot of areas for patrons to take a break from shopping and recharge, with the beautiful views throughout the property. Trash pickup and leaf removal are the main priorities here, with weed removal and tree maintenance also taking place to ensure a pleasurable experience by all shoppers. Sarah Webb is Landscape Management's associate editor. She holds a bachelor’s degree from Wittenberg University, where she studied journalism and Spanish. Prior to her role at LM, Sarah was an intern for Cleveland Magazine and a writing tutor.